Lille’s recent performances raised some questions about the Marcelo Bielsa revolution in North of France. Just few games into the season and Bielsa is already highly scrutinized by fans, media…also by some into the club’s board of direction. Surely, team’s roster was overhauled since new owner Gérard Lopez took over the club last January with seventeen players that have left the club this year. Some departures were inexplicable as the ones of Vincent Enyeama, one of the best net minders in France, and of Nicolas de Preville, who netted 14 goals Ligue 1 last season, who has been recently sold to Bordeaux. A 3-0 victory over Claudio Ranieri’s Nantes aside, Lille’s display was uninspiring, slow, chaotic at the best. Although Bielsa has shaken things at Lille, and while it requires time, many thought the Argentinian would have been able to make things working faster. That’s has not been the case and speculation over Bielsa’s future grows as he lost his cool with the press pack that he believes have repeatedly done him a disservice. Bielsa’s tactical decisions too have left many thinking what Lille’s game plan is. With the squad lack of experience, the Argentinian still continued to run his classic way of changing players’ positions. Bielsa is well known for his tendency to convert central midfielders or fullbacks into centre-backs in an attempt to have more technically skilled players into the back line in order to help the ball to progress out from the back. Also, Bielsa is not new to switch players’ positions moving footballers higher up or a bit lower the field. So, at Lille, nor could have been surprised when Bielsa put Nicolas Pépé, a 22-year-old winger, into the lone forward spot. That said, former Angers has been highly uncomfortable so far into a new position that left him isolated up top and unable to fully exploit his peace and speed. The 20-year-old central midfielder Thiago Maia also was a major disappointment also according to the utilization which he’s being put. In fact, the Brazilian came from Santos as a playmaker while Bielsa – followng a couples of poor performance with Lille – abruptly moved him to left-back where he struggled. Tactically, Bielsa generally switched between his favourite 3-3-3-1 and a 4-2-3-1 formation depending on the opponent, focusing on pressing everywhere. Ultra-offensive formations and high pressing are features of Bielsa’s way, but they represent a huge change from the past versions of Lille, a team suited to play a possession oriented and more defensive play style. So, while the old style LOSC was used to remain compact and sit back defending depth, Bielsa’s Lille is defending aggressively behind a high press tactics that move the side making the positioning and shape of the team changing during the games. Usually, centre-backs spread out with the full-backs who push high up very to field acting as wing-backs in the way to provide width. The central midfielder is often isolated in the building up as his central partner – usually former Lyon man Yassine Benzia – has been given freedom to drift up top behind Pépé. This move switching the initial 3-4-3 in a 3-3-3-1 shape recalls what happened in 2002 World Cup when Guus Hiddink’s side had one of his central midfielders moving high up the pitch to become an attacking midfielder. Quick one-two, and movement should complete Lille’s front four play. Under their new regime, Lille come out on the pitch trying to play as Bielsa’s Chile when the Argentinian lined up the South American side in a 3-3-1-3/3-4-3 diamond formation featuring Mark Gonzalez and Alexis Sanchez out wide, closed to the touchlines and with Matías Fernández in the dual role to be Chile’s attacking midfielder with the team in possession and the second central midfielder with his side out of possession. With Chile, Bielsa wanted a spare man at the back – a back three against two strikers or a back four against one forward. He replied this strategy at Lille which means the aforementioned switch between 3-3-1-3 and 4-2-1-3 depending upon the opposition. The use of Luiz Araújo at left-winger was a bit surprising as the Brazilian is maybe more suited to play as No.10. However, he performed well, building a good relationship with the left-winger. Like many flankers that played under Bielsa, Araújo too played internally occupying the left centre-half, meaning that his runs were often diagonal, towards goal rather than outside. On the other flank, Anwar El-Ghazi was the only bright spark so far. He usually came inside to the right centre-half but he also has been able to stretch the field holding a wider position. By coming inside toward the middle of the field, El-Ghazi creates spaces for the overlapping wing-back. Stats and diagrams can help us to have a deeper understanding of Bielsa’s woes at Lille. It starts with ball possession and expected goals. 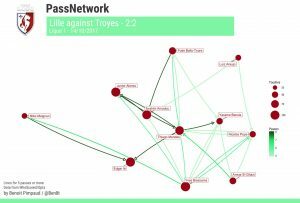 Benoit Pimpaud ‘s pass map of LOSC’s game against Troyes highlights Lille’s issues to connect the front four with the rest of the team. Hallmarks of Bielsa’s offensive tactic feature going deep downfield as soon as possible, ball possession and pitch a tent into the opposition’s territory. “We want to attack at all times if possible, but defend well when we have to, and against the counter. We want to play in their half and keep the ball on the ground,” the Argentinian told reporters. When at Marseille, his team average possession fluctuated between 52% and 58%. Under Bielsa, Lille’s current average ball possession is still high (56.1%). That said, Lille’s expected goals (xG) are 7.80, just better than Amiens. They scored merely 6 goals out from 9 games, despite the 12 shots per game they are producing (12th in Ligue 1). In their usual manner, Bielsa wants his side pressing with a clear man-to-man approach. The lone forward would generally occupy the first ball carrier of the opposite team, whilst the wingers would occupy the centre-halves positions to challenge any switches. Benzia would often move deeply back higher to sustain Ibrahim Amadou – the holding midfielder also charged to help the build up with Lille in possession – whilst the wing-backs collapse back tracking the opposition’s flankers. However, Lille’s pressing organisation often varied as Bielsa’s side constantly reacted to the structure of the rivals. The man-orientations largely increases when LOSC dropped back into their 5-4-1 mid-block, focused on man-marking and central compactness. The focus here is on marking the player who’s receiving the ball with a defender who can break the line and move high up the peach to follow the ball receiver. The other players focus is to deny any spaces around the ball with the option to move into man-marking against the surrounding players. The advantage of man-marking is that LOSC’s defenders always get access to the ball carrier meaning they can quickly challenge for the ball. That’s a kind of space-orientated man-to-man marking in which Lille’s defenders start covering their own zone, then they come to man-marking the opposing player when he receives the ball in that zone. The disadvantage lies in the fact that Lille’s man-marking has been sometimes manipulated by dragging the defenders out of positions. Moreover, when opponents had good 1 vs. 1 skills, they made tough for Lille’s players to defend against. Bielsa’s has been not so efficient so far with LOSC that allowed 14 shots per game with Toulouse, Amiens, Dijon and Metz as the only sides that have done worse. Lille also allowed 15 goals whilst their xGD (differential between for and against expected goals) in open play is -4.49 with their xGA being 10.64. Expected goals difference is a stat which can give us an idea on Lille’s defensive efficiency this season. LOSC’s defensive fragility plagued Bielsa’s side so far. Paradoxically and contrary to what is widely thought, Lille’s xGD is better when they have been lined up in a 3-3-3-1 formation (0.69) than in a 4-2-3-1 shape (-3.16). This deep overhaul requires time to work and so could be a bit premature to evaluate Bielsa’s work so far. That said, results fell short of expectations and questions have been raised about Bielsa’s tactics and man-management ability. Tycoon Gerard Lopez bought Lille with the clear goal to made LOSC an elite team in Ligue 1. Bielsa and Luis Campos, the scout who built the Monaco side which won Ligue 1 last season, have been hired to make this dream come true. The challenge for Bielsa was make the job done while implementing his attractive football style at the club. He has to do it in a while as Lopez gave the manager just a two-season contract. But recent results could shorten Bielsa’s regime. Lille’s recent loss against OM at home left them with just six points after 10 games. How Bielsa’s system will work in a short-term is highly unpredictable. His recent track record features a mix of success (Athletic Bilbao, the Chile national team) and failure (Marseille). We will see what happens.